The Mr and Mrs Bass Club held its second night tournament of the 2011 season on Lake LBJ with the full moon overhead. The tournament started at 2am Saturday morning and ended Saturday morning at 10am. Weigh in was held at the Cottonwood ramp. It was good to see two new teams at this month’s tournament. We welcome back to the club Alice and Luther Lentz. 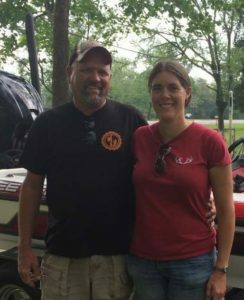 Bob and Jane Bingle our newest addition to the Mr and Mrs Bass club also showed up to fish their first tournament of the year with us. On this night the team of Leslie Killough and Brent Parish topped the field of eleven teams with a five bass limit weighing 16.97 pounds. The Parish/Killough team has proven themselves to always be contenders when the club goes to Lake LBJ. Brent Parish also took men’s big bass honors with a nice 5.81 pound lunker. 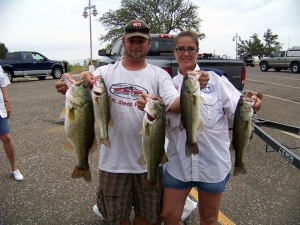 In second place with 11.08 pounds was Alice and Luther Lentz. Rounding out the top three teams with 9.91 pounds was Robert Brown who’s wife Lesli wasn’t able to make the tournament which resulted in Robert fishing alone. Women’s big bass went to Pat Gold for her 3.49 pound catch. Next month we will be heading to Inks Lake. See you there!